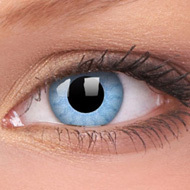 Discover breathtaking blue eyes with ColourVue Solar Blue Contact Lenses. These ColourVue contact lenses have a delicate blue design that enhances and brightens your natural eye colour. Solar blue contact lenses are not completely opaque and allow a little of your natural colour show, placing a fresh blue tint over the top. 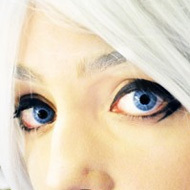 If you have blue or green eyes Solar Blue contact lenses will give you a beautiful electric blue eye. The effect is quite intense and slightly beyond the sort of blue that looks convincingly natural, but I think they look awesome. 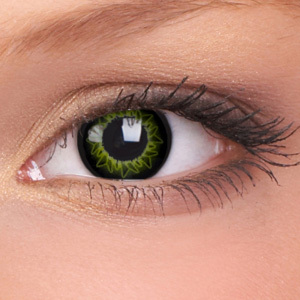 These lenses are perfect for a magical, otherworldly style – a real head-turner. If you have darker eyes the Solar Blue contact lenses will still give you a very striking look, with the blue tint overlaid on your natural eye colour. And because these are ColourVue lenses, they feel very comfortable all day long. All ColourVue contact lenses are made from Hydrogel, a patented lens material that is 45% water, very soft and gentle on your eyes. It will keep your eyes hydrated all day long and personally I think it really makes a difference – especially if you’re wearing your Solar Blue lenses for more than a couple of hours. This entry was posted in Contact Lenses and tagged blue contact lenses, color contacts, colour contact lenses, Coloured Contact Lens, Coloured Contact Lenses, Coloured Contacts, Coloured Lenses, colourvue, colourvue contact lenses, Contact Lens, contact lenses on April 2, 2010 by Piercing Guru.